I finished Diane's poncho tonight. I've been working on it, off and on, since March when she came down from Oregon for the Egg Show in Westlake Village. Diane makes the most beautiful objets d'art from . . . eggs. Chicken, hummingbird, ostrich, goose . . . you get the idea. 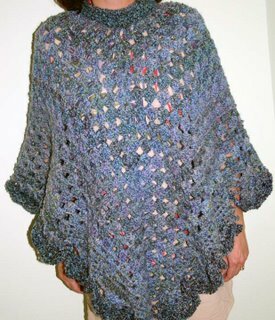 I used Lion Brand's Martha Steward Coming Home pattern (I call it the 'Get Out Of Jail' poncho) in Homespun's "Windsor" colorway with a size "M" hook. Diane picked out the yarn. BK and I tried to talk her into something more "wild" (i.e., colorful) but she was having none of it. And now that it's done, I think she was right. I love the colors. 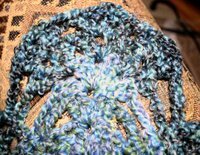 I’ve started that darn shawl three times, but haven't been happy with my yarn choice. Now that I see this one finished, I can't wait to go yarn shopping again. - Do you think I'm just looking for another excuse to yarn shop? Hmmmmmm, even I might have to give that question some thought. Okay, Elisa, You hooked me!